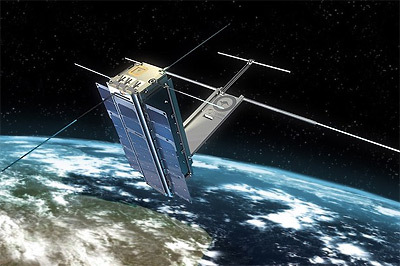 RAAF M1 is an Australian 3U-CubeSat designed and built by University of New South Wales for the Australian Defence Force Academy, Royal Australian Air Force. Deliver to the RAAF AIS / ADS-B capability across the globe using COTS AIS and ADS-B systems. Test, validate and further develop Australian SSA capabilities by providing engineering design and performance data for the design of future passive radar systems to track LEO spacecraft. Develop and demonstrate software defined radio capability, which is used to support AIS and ADS-B monitoring and recording and GNSS SDR receive capability for passive LEO tacking. Develop and demonstrate building-block technologies and CONOPS for future ADF space capabilities. Build ADF expertise in specifying, developing/procuring and operating sovereign space assets. The RAAF M1 spacecraft is a 3U Cubesat form factor with a nadir facing deployable payload module and two deployable solar arrays. As well as monitoring and recording AIS and ADS-B signals from maritime traffic and aircraft, the mission will demonstrate a number of new developments; bespoke mechanical design supporting a large deployable model, a custom UNSW Canberra flight computer, custom deployable antennae and custom software defined radio receivers. The programme demonstrates that a system such as this can be developed under a rapid design and development programme. The satellite was launched on Spaceflight Industry's SSO-A multi-satellite launch on a Falcon-9 v1.2 (Block 5) rocket. It failed to communicate after deployment.